With the occasion of the French Revolution centenary (1789 – 1799), the French government decided to celebrate and mark this spot in history by building something special that would stand as a memory in time. The project for this building was offered in an open competition where everyone could provide their designs. This was announced during an international exposition and would be built on the Champ-de-Mars, located in the center of Paris. 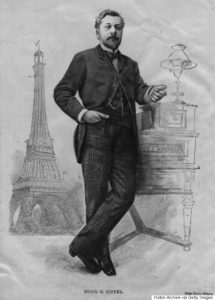 More than 100 designs were submitted and the Centennial Committee decided to choose the design of one person named Gustave Eiffel. Eiffel, an engineer by profession, specialized in bridge building, known also for designing the Statue of Liberty, now had the difficult task of building the tallest man made structure. 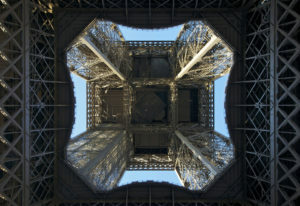 The tower would reach close to 984 feet (299m) and would be made entirely of metal. The design was received with skepticism by critics who argued that it would not be structurally sound and a lot of people argued that it would destroy the good looking image of the Paris center. This however did not deter Eiffel in his plans to write a page of history and managed to complete the building of the tower in two years while being under budget. Other things that can be taken into account as something out of the ordinary for that time is that only one person died during the construction, a remarkable number if we are to think about the height and manpower needed. The tower structure consists of an iron framework supported on four masonry piers, from which rise four columns that unite to form a single vertical tower. Platforms, each with an observation deck, are at three levels. It was the tallest man made structure until the year 1930, when the Chrysler building was built in New York. The tower has been declared officially open on the 31st of March, 1889. Interesting facts about the Eiffel Tower: in 1909, 20 years after its completion, it was almost demolished due to the lease on the land it has been built on expired. It has been saved due to its value for the antenna radio transmission. Also, during the Nazi occupation of Paris during the Second World War, the lift cables were cut down so that the Germans had to climb the tower in order to put their flags.